Dobrudden Caravan Park & Camping Cabins01274 581016work Camping ParkDobrudden Caravan Park has been established since the 1950's, though the farm has stood for centuries. The park is set on the breathtaking and beautiful moorland of Baildon, steeped in rich history dating back to the Iron Age. Dobrudden boasts excellent views over Shipley Glen and surrounding areas. Peaceful and rural setting yet only two miles by car to Baildon village. The park has a vivid array of wildlife! There are an abundance of attractions, nature walks and entertainment venues nearby and in the surrounding towns. Open from 1st March - 31st December every year. 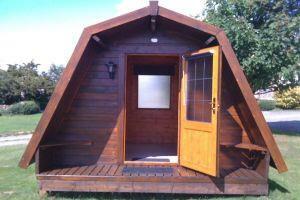 Dobrudden Caravan Park offers camping and soft and hard standing caravanning pitches. Static caravans for sale and long term rent (2 weeks minimum). Golf available nearby. Seasonal cafe serving Breakfast and snacks. Disposable BBQs and coals for sale. Children welcome from any age. From Baildon Village, at the roundabout take the road out of the village towards the moors, passing Websters Fish and Chips on the right and crossing a cattle grid. After the cattle grid take the first left, heading up hill with reservoirs on your left and golf course on the right. At the top of the hill, the caravan park road is signposted to the left, opposite the first car park. Follow this unmade road over the moor for approx 1 mile until you reach Dobrudden.